Far Yeast Genryu Fest is a 4.5% mild ale from Far Yeast Brewing Company, based in Yamanashi, Japan. It’s part of their limited edition collaborative range, with this one being brewed with Kosuge Village, located near the Yamanashi Brewery. It was first released in November 2017 and uses water sourced from the Tama river, which starts near Kosuge village. Far Yeast Genryu Fest has been lingering in my fridge for a couple of months now – it was a forgotten purchase from GoodBeer a while back. Well I finally opened it. It poured out a hazy orange brown colour with a meagre amount of flat white head on top. The head faded fast to some bubbles around the side of the glass. Far Yeast Genryu Fest had a sweet caramel aroma along with some peachy, earthy hops. Even though it came in a bottle, Far Yeast Brewing Genryu Fest had a weird metallic tinge to it that made me teeth chatter. 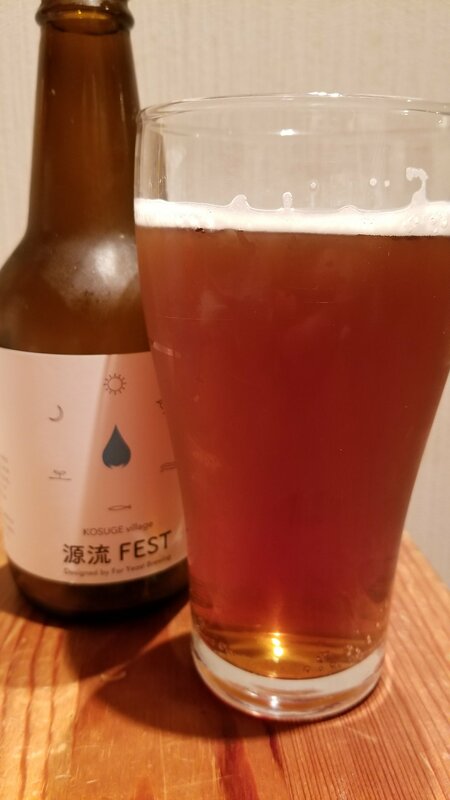 Those some aromas appeared in the body – earthy caramel tones – but there was a distinct papery oxidised lingering flavour to Far Yeast Genryu Fest. The body was also very thin, with a watery like texture to it and no bite. It’s drinkable when chilled but that papery flavour was not nice when it had warmed up. Perhaps the bottle was not as fresh as it should have been, but it was drunk within two months of production according to the side of the bottle. A definite miss from Far Yeast Brewing Company on this one.